Classical artists . . . Salon-style concerts . . . Performance seminars . 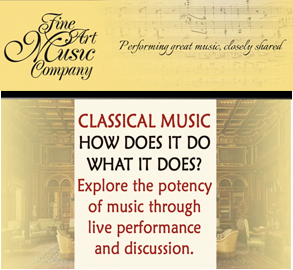 . .
Fine Art Music Company brings together exceptional local musicians and listeners through creative concert programming held in the intimacy of smaller halls and salons. 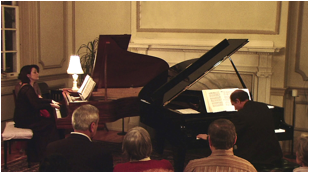 We feel the potency and depth of classical music is best experienced in settings that bring audience and musicians nearer one another with greater connectedness. Our mission is to intensify a tradition of creating the most intimate and meaningful experience possible of shared music-making. 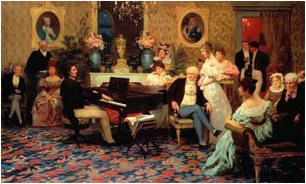 CONCERTS & PERFORMING: We follow in the past tradition of closely- shared music performance amongst musicians and interested listeners that happened routinely in drawing rooms, parlors, salons. People could converse, respond openly and feel personally involved in the creative process of the musicians. In our performances, we combine the formality of a full concert program with a personal touch of communication between musician and audience. Performers will share ideas and background about the music, which consciously invites our audience in, eliminating the typical separation existing in many concert venues. We design our concert programs thematically of works having dynamic relation to each other, to further stimulate a greater depth of understanding and enjoyment for the listener. We frequently include works of an unusual nature to elaborate on the range that composers use to create music. Performance/Listening Seminars: A special way we have chosen to engage music lovers with deeper insights into fine music is to offer creative and expansive music seminars. “FOR THE LOVE OF MUSIC: How does it do what it does?” is devoted to examining the potency of musical expression. In a kind of master-class for listeners, musicians openly share their playing of classical pieces, revealing their own discovery of musical ideas. Audiences are invited to listen, respond, and participate in this discovery, leading to the grasping together musical meaning in its pure and wordless form. OVERALL: in working to broaden audience appeal to the classical world of live performance, we provide a more intimate and personally satisfying, musical experience for the listener, as well as closer, more ‘human’ interaction for the musicians. 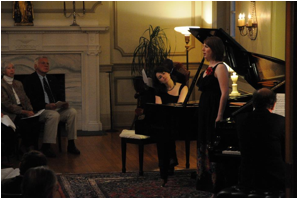 IVY HALL: Since 2010, Fine Art Music Company has presented its culturally diverse, music concert-salons in Ivy Hall, under the auspices of the International Institute for Culture. Launching its seminar series in January of 2013 has been its latest endeavor. Its aims are to present a continual offering of unusual, high-quality programs exploring many corners of classical music and its off-shoots, create artistic experiences as fascinating and rewarding forays into the artistic mind of mankind.